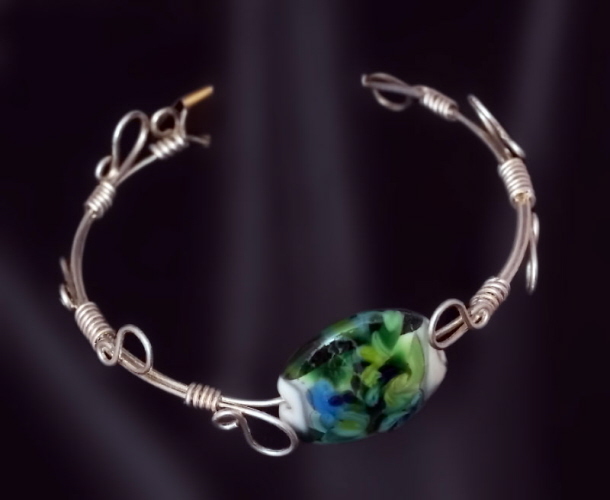 Love this lampworked bead, hand crafted by Sallie Licata. Shades of greens and blues and creamy white are some of my favorite colors and speak of the ocean to me. Lentil shaped bead is approximately 25 mm in diameter. Bangle constructed and accented in heavy gauge argentium wire. Best fits a wrist measurement of ~6 - 6½ inches. Weight is 0.6 oz.